Review by AllTheBestFights.com: 2016-03-05, some good exchanges between Sam Eggington and Bradley Skeete but it is not enough to get three stars: it gets two. Sam Eggington entered this fight with a pro boxing record of 17-2-0 (9 knockouts) and he is ranked as the No.33 welterweight in the world. He lost to Johnny Coyle in 2014 but then he has won eight consecutive bouts. His opponent, Bradley Skeete, has an official record of 22-1-0 (10 knockouts) and he entered as the No.49 in the same weight class. He suffered his only defeat when he faced Frankie Gavin in 2014 (=Gavin vs Skeete), after this bout he has collected four victories. 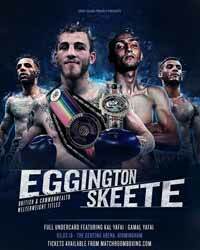 Eggington vs Skeete is valid for the BBBofC British and Commonwealth welterweight titles. Watch the video and rate this fight!